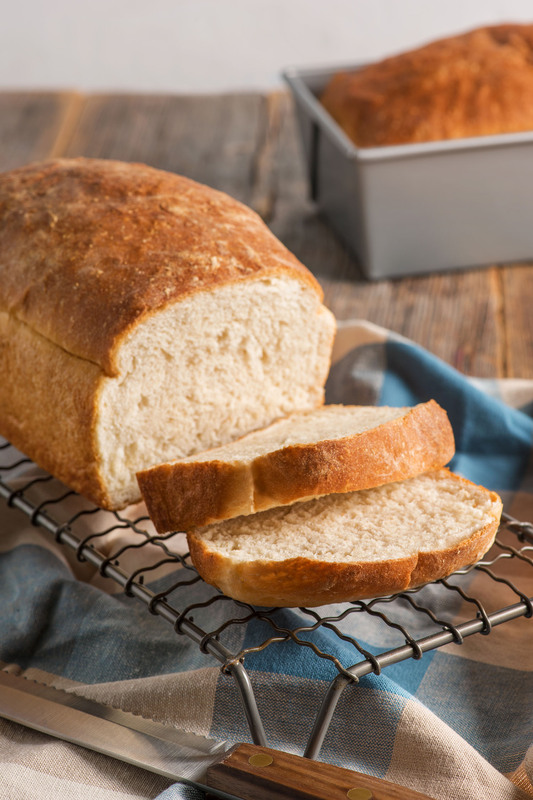 You just can't beat classic white bread - perfect for sandwiches, toast, and French toast. In mixing bowl, combine 1 cup flour, salt, sugar and yeast. Stir to combine; set aside. In a saucepan or microwave-safe dish, heat water and oil to 120-130°F. Add warm liquids to dry mixture; mix with dough whisk or wooden spoon until blended. Gradually stir in enough remaining flour to make a soft dough. Turn out onto lightly floured surface; knead for about 5 to 7 minutes or until smooth and elastic. Use additional flour if necessary. Place dough in lightly oiled bowl and turn to grease top. Cover; let rise until dough has doubled in size, about 45-60 minutes. Turn dough onto lightly floured surface; punch down to remove air bubbles. Roll or pat into a 14x7-inch rectangle. Start with shorter side, roll up tightly, pressing dough into roll. Pinch edges and ends to seal. Place in greased 9x5-inch loaf pan. Cover; let rise until indentation remains after touching, about 30-45 minutes. Bake in preheated 375°F oven for 30-40 minutes. Remove from pan; cool on wire rack. Just follow the bread machine manufacturer’s recommendations or ingredient order. For more recipes to try, we also have a ‘bread machine recipe’ section here >> https://redstaryeast.com/recipes/bread-machine-recipes/. What if I’m using the rapid rise yeast. Do I still punch it down or do I shape it, pan it, rise it then bake it? Platinum yeast is an instant yeast, so follow the directions as written. If I use this for pizza dough does it have to rise the second time and can I split it and freeze it after first rise? We’re glad that you find our videos helpful! Visit the link below for more information on how to use the microwave for proofing (rising) your dough: https://redstaryeast.com/yeast-baking-lessons/baking-steps-guide/rising-ripe-test-first-rise/.